Live bright, live neon! There is nothing more striking than making bright accents in your home and if you try to achieve the maximum of colourfulness neon might be the answer. Neon was THE thing in the 80s and has appeared in a more reduced way again and again since then. Some people say it's only for punks, some say it looks cheap, I say it's the perfect time to bring neon back for real! It goes very well with modern, minimalistic spaces and is a bold statement. If you have a lot of earthy tones at your home, don't be afraid to give neon a try. Some bright sparks can be a spectacular contrast to dark wood for example. 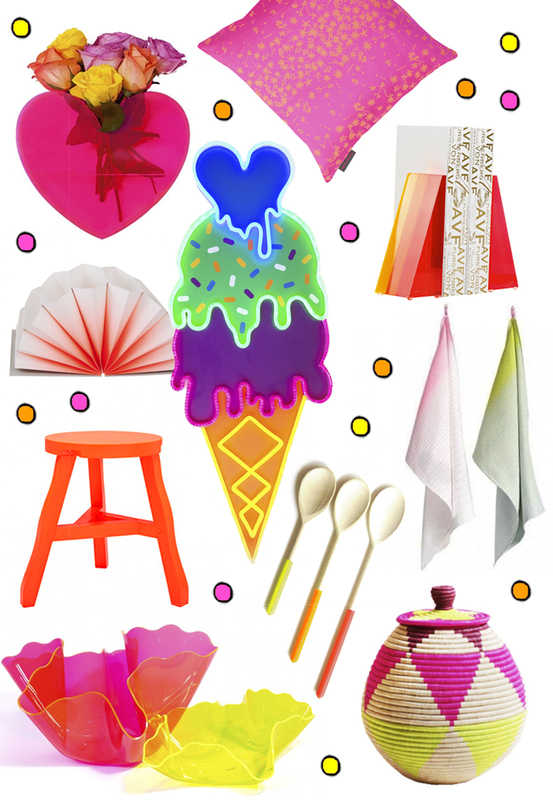 Personally, I think the best neon piece to invest is a huge light – like this gorgeous ice cream (Yes, I am guilty of ordering it and can't wait to see it right next to my dining room table). As a graphic designer, I created many signs in my career and dreamed for ages of having my own. Finally, I will have my own disco at home, neon party forever! If you don't feel that bold, just go for a single neon accessory like a bowl, a vase. You will smile when the sun rays coming through your windows will meet the shockingly colourful neon and cause bright reflections.